We previously examined a billboard ad that failed to convey its unique value proposition, or its benefits, … or really any reason why you’d want to move into a tiny apartment. The imagery in this video is great, too, but I want to focus on why that sentence is so powerful, and how you can draft your content to have the same impact. If you pick up a brochure for these pots and pans, or visit the website, you’ll see a list of features. The non-stick surface, for instance, can cut down on cleanup time. The cookware’s hard anodized aluminum construction creates excellent heat conduction for even heating, so your food comes out more consistently cooked from side to side. But those features aren’t mentioned in this commercial. They focus on two related pain points the audience is struggling with: There’s not enough space in our cabinets for all the pots we own; and the pots we do own don’t fit neatly together in the limited space we do have, so we stack them in a messy jumble that tumbles when we retrieve one of the pots from the stack. Then we’re forced to collect up those other pots and pans and restack them Jenga-style again. But you won’t have that problem with this cookware, the ad says. It’s a compelling case for the cookware because they’ve directly hit on a frustration much of the audience has and solved it. That’s how you build powerful ads. In your marketing materials, do the same. Look for just one, two, or, at the most—depending on the length of your piece—three pain points your audience is suffering through, and feature your solution to that. That’s it. Don’t overload the audience. Then, make another video/case study/white paper that addresses another pain point. Now, I have no idea if that’s true. 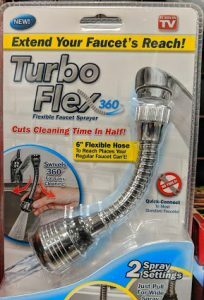 But the claim alone made me look closer at this product—and I wasn’t even looking for a faucet hose. This packaging lists several features, but the big benefit is front-and-center and, again, concise. It touches on the pain points felt by much of its audience—who wants to spend time cleaning the kitchen sink?—and it attacks that pain point with a simple benefit that the members of the audience will find appealing. I didn’t end up buying the Turbo Flex, but its message stuck with me. And maybe down the road, when I need a new faucet hose, I’ll remember this and buy one. And that’s what good marketing should do. When crafting your marketing messages, start with your audience’s pain points, and then select one or two points and show how your solution solves those challenges. That’s how you create compelling messages that resonate with your audience. Need help crafting a tightly written benefit statement for your product/service? I can help.